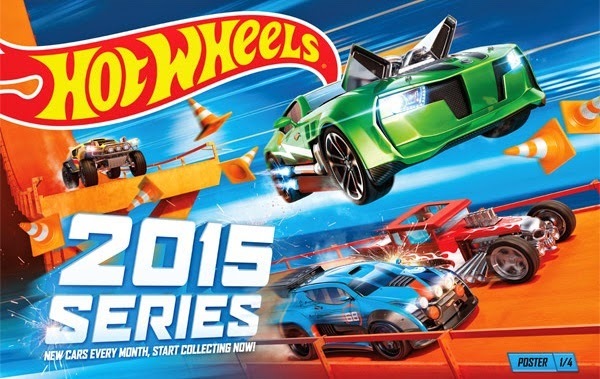 What is the fastest 2015 Hot Wheels car? Well here's the list. UPDATE: I've changed some things for the 2015 Speed List. I've decided to run the cars on a different track with a more accurate timer. The track has a bit higher drop and is Hot Wheels orange track. I've re-run all the cars and the times and order on this page are up to date. I will be working to update the links to the cars and their race, but they may still be linked to their old race on the "Drag Tracks" race track. I've left the "old rules" and info below as a reference and will do so until everything else is up to date. Each time we get a new car from the 2015 line, we'll run it on our track, get a time on it and put it on the list. All cars will be run on the same track. Cars are opened and run 5 times down the track to 'break them in". The 6th run is timed. For interest, cars will be raced against a random car from our collection. The new 2015 car will always be raced in lane 1. Every car is different, multiple cars of the same casting can run faster or slower, but some castings are definitely faster than others, so this list should give a general idea as to which cars are the fastest. The track is not Hot Wheels orange track. It is a Dragtracks race track. The lanes are slightly wider than normal Hot Wheels orange track. However, most cars that are fast on orange track are fast on the Dragtracks and vise versa. Don't put too much stock in the times of the challenge cars from our collection. They are played with daily by my son and I and aren't always in the best shape. So a car that may normally be fast might not be as fast in our speed tests. Click on the car for the race video. Be sure to tell us what your fastest 2015 car is down in the comments! Wow. I love the amount of detail and care that you've put into these trials and results. Love the Leader Boards with click-thru links to the videos. Great idea. Personally, my fastest 2015 car has been the Pharodox, but I haven't been able to run the same tests and trials that you have. Awesome post.